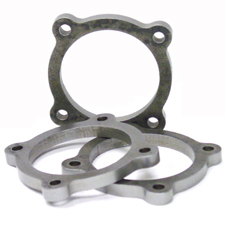 CNC Machined 4 bolt flange for GT/T3 turbine without internal wastegate. Machined with 3" inner diameter for 3" Downpipe use. * This flange is used for the newer GT housing with the long neck discharge and 3" ID opening. If using GT/T3 housing with shorter discharge neck and 2.5" ID opening, use P/N ATP-FLS-032 flange.